This is just to name a few of the descriptive monikers the sound has taken on. New Yorker magazine even took a shot and described it this way; “…that low and loud synthesized hum—ominous and brain-addling.” Within you’ll find 100 unprecedented ultra high-quality 96k 24bit .WAV files to add to your personal arsenal of sound. This signature making selection of original BRAAAM sounds is all new and premium quality recordings. Whatever you call it, however, you use it, in whatever creative audio context, BRAAAM that’s cool! BRAAAM Strike – Now the power is within. Created by award-winning composer and sound designer, David Levy. 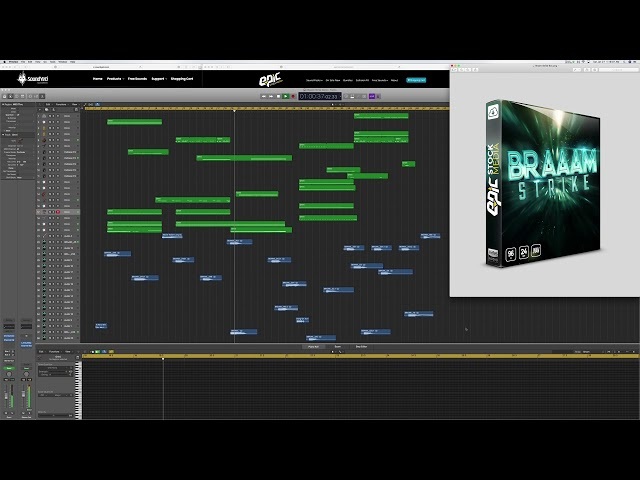 BRAAAM Strike is designed to bring dramatic dynamics that raise your productions to new levels. BRAAAM Strike’s signature set of BRAAAMs add exclusive flavors to your audio projects. Used by today’s top-tier composers and cinematic sound designers, this well-perfected synth horn impacts library adds 100 unprecedented ultra high-quality 96k 24bit .WAV files to your personal sound bank. Save time, and gain valuable, head-turning sounds that beckon a new level for your cinematic music and blockbuster trailer productions.